DISCOVER YOUR PURPOSE. FIND YOUR TRIBE. Join the Hive global community of 2250+ purpose-driven leaders from 125 countries who are working on creating a better world. Apply now for an invitation to the Hive Global Leaders Program in Lagos-Nigeria September 11-14, 2019. What is the Hive Global Leaders Program? Our flagship program,the Hive Global Leaders Program (GLP) is a 3-day world class transformative program on leadership community, integrating elements of entrepreneurship, purpose, life design, wellness, authentic relating, personal development, and global systems thinking for mission-driven leaders, innovators, and entrepreneurs held around the world. It is designed as the entry into a lifelong community of leaders working together on creating a better world. 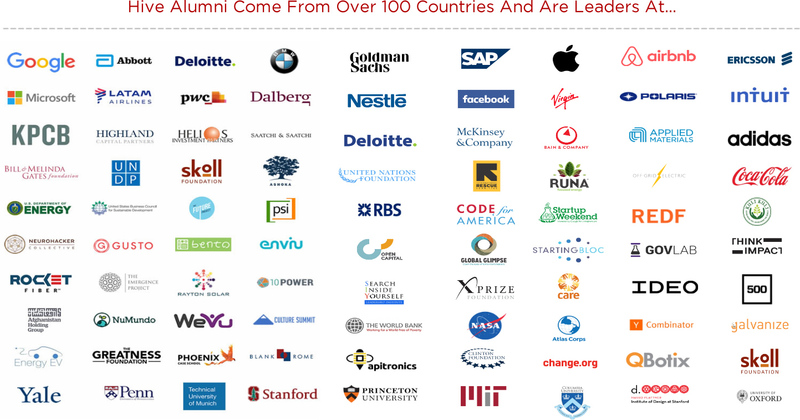 Over the last four years, Hive has built a global alumni community of 2500 leaders and entrepreneurs from 125 countries who are working on creating a better world. Hive Global Leaders so far include CEOs of $250 million companies, award-winning Ashoka Fellows, elected leaders, neuroscientists, Olympic Gold Medalists, Rwandan genocide-survivors turned inspiring public speakers, technology entrepreneurs, Harvard and Stanford professors, Sudanese refugees turned scientists, renewable energy investors, Nepalese activists, World Economic Forum Young Global Leaders, IDEO design thinkers, top engineers from Facebook, Google, and Apple, World Bank and UN researchers, venture capitalists, Virgin Galactic astronauts, and many more extraordinary leaders working to create a better world. Hive isn’t a regular event at all. It is a in-person three-day collaboration with extraordinarily talented creatives and innovators from 30+ countries designed to welcome you into an extremely high quality peer network for you throughout the rest of your life regardless of where you travel or what journey you take. The Hive community will always be with you wherever you go. At Hive, there are few handshakes and business cards exchanged, and a lot of hugs and lifelong relationships formed. Over 90% of Hive attendees are CEOs, and leaders of their organizations. What each attendee has in common is a shared passion for creating a better world. At Hive, you’ll have the opportunity to reimagine the future of society, reflect on your life’s purpose, create an action plan for the next phase of your life, implement daily habits that will help you make a bigger impact, and join a committed network of mission-driven leaders who can help you achieve your goals. Our biggest Hive event of the year will be the Hive Global Leaders Summit schedule for August 15-18, 2019 in Silicon Valley, CA at 1440 Multiversity. Contact us for an invitation to attend. Clarity: Get clarity on your purpose, goals, habits, and action plan for the next phase of your life. Confidence: Join a lifelong global network of leaders who will support you through the challenging times in your journey. Community: Re-imagine the world together with a brilliant, diverse, and caring group of entrepreneurs, scientists, engineers, entrepreneurs, technologists, artists, activists, academics, athletes, writers, teachers, architects, executives, investors, international development professionals, and political leaders then join a lifelong peer community of leaders that is with you in each city you visit. Day 1 is focused on what’s going on in the world. Day 2 is focused on what’s going on in your life. Day 3 is focused on what’s going on in your work – and how to use your work to make a positive impact. You will leave Hive inspired but also rooted in a new calm presence you bring to your work. You’ll feel grounded in new habits and in new ways of living happy and healthy lives of gratitude and joy and have a lifelong community of supporters wherever you go. You’ll take away your framed one page life plan from Hive’s “Designing Your Life Workbook” that helps you get deep clarity on your purpose, goals, habits, and action plan for getting to the next level in your life. You’ll have time to reflect, time to learn, time to play, and time to plan your next steps as a leader as you enter this next phase of your life ahead. The Hive Global Leaders Program is designed to educate and connect extraordinary people who are making a big positive impact in the world. The curriculum has been built for mission-driven leaders and entrepreneurs who are dedicated to creating a future that is radically better than the present. The Hive curriculum has been influenced by the Harvard Business School MBA program, the Singularity University Executive Program, the Stanford d.school, the Harvard Graduate Student Leadership Institute, and the work of Google X pioneer Tom Chi. On day one we look at what is happening in the world. We look at the Global Grand Challenges, look at how humanity is doing across health, education, economics, happiness, and the environment, look into the future of science and technology and the biggest opportunities for millennials, work together on the principles upon which we might redesign the global system, and experience a rapid prototyping workshop with Tom Chi. On day two we discuss what is happening your life, look at your health and wellness and your financial plan, go through a Designing Your Life Workshop, create your goals, reevaluate your habits, and create your personal one page plan. Finally on day three we look at what is happening in your work and learn about authentic leadership and scaling an entrepreneurial organization, cover expansion stage sales and marketing, hold a Hive Unconference, and end the day with each participant framing their one page life plan and presenting their purpose to the group. Hive is building the global community for leaders and entrepreneurs who are creating a better world. Join us. Apply now for Hive. So far, we have hosted twenty two Hive Global Leaders Programs (GLPs) have convened 2250 entrepreneurs, leaders, and innovators from 125 countries around the world. Hive Global Leaders include CEOs of $250 million companies, award-winning social entrepreneurs, elected leaders, neuroscientists, Olympic Gold Medalists, Rwandan genocide-survivors turned inspiring public speakers, technology entrepreneurs, professors from Harvard and Stanford, Sudanese refugees turned innovators, renewable energy investors, Nepalese activists, World Economic Forum Young Global Leaders, IDEO design thinkers, top innovators from Facebook, Google, and Apple, World Bank and UN researchers, venture capitalists, Virgin Galactic astronauts, and many more extraordinary leaders working to create a better world.